There’s no transition. Only acceleration. New technologies are already starting to impact how people make a living and there is a fear that many will be left behind. But before further indulging that fear, do we really understand what’s going to happen? While predicting the future is always hard, the past is a good place to start. The trick is figuring out how the present differs from the past, and to try to estimate how this will impact our collective tomorrows. It is unsurprising therefore that current discussions about the future of work frequently refer to the difficulties of previous ‘transitions’; it is not necessarily that we are going to a bad place, but getting there is going to be rough. However, the implication is that we are moving from one stable state to another one. And while that may have been true of the past, it will not be true of the future. However, there is nothing special about the year 2030; it was likely chosen because it is a round number, far enough away that things will have definitely changed, but close enough that most of us will still be working. Yet neither this report nor any other suggest that change will stop, slow down or even stop accelerating at that time. If we look at what humans have been doing over our history, for most of those many thousands of years, it wasn’t really much. Things started to pick up from the industrial revolution until around 1950. 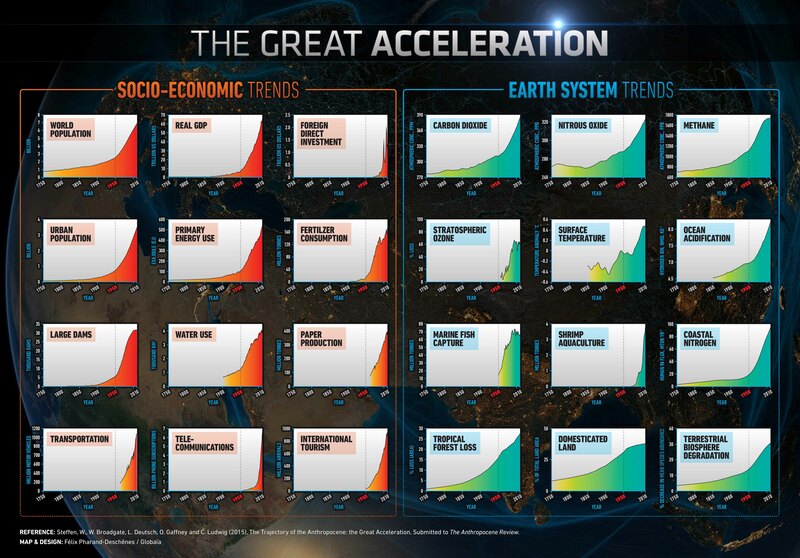 At that point, human activity took off, in what has become known as The Great Acceleration. Population, real GDP, energy use, water use, foreign direct investment, telecoms, and transportation use have all risen sharply, according to research carried out by the International Geosphere-Biosphere Programme and the Stockholm Resilience Centre. For example, the world’s population grew from around 2.5 billion in 1950 to about 7 billion by 2010, with real gross domestic product increasing from less than US$10 trillion to more than US$60 trillion over the same period. In fact, the impact of human activity on the environment has prompted some scientists to suggest the world has moved into a new epoch, the Anthropocene. It is true that some, if not most, of these measures of human activity will level off in the coming years – The United Nations forecasts population to peak at 9.8 billion in 2050, for example. But those trends most closely tied to science and technology are merely laying the groundwork for even faster-developing technologies that will challenge what we have come to expect from the corporate organisation, itself a modern concept. That means change will not just continue, but it will continue getting faster. For example, Facebook was born in the era of the personal computer, which helped it reach 100 million users in just four and a half years. WeChat, a Chinese social media platform, was born in the era of the smartphone, and reached 100 million users in just 433 days. Today’s technologies enable tomorrow’s technologies to proliferate at ever-greater speeds. Time to get worried? No. Time to radically adapt? Yes. So does this mean we’re heading for a ‘technological explosion’ of artificial super-intelligence that improves itself in ever shortening cycles? Fortunately, it is unlikely to be that scary. But it will be a rapid evolution of jobs as automation takes over specific tasks. The important point is that this evolution will intensify. We will need to learn new skills not on a regular basis, but rather on an increasingly frequent basis. Rapid learning (and forgetting) itself will become the core skill, with adaptability becoming the differentiator between success and failure. So if you think the world is a bit hectic and complicated now, take a deep breath. The future of work will be perpetual, accelerating change, and the quicker we drop the idea of a transition, the quicker we will be able to embrace the need for radical adaptability.